der mich einlädt ihm zu folgen. aufhören zu sein, was ich bin. zulassen, dass es mich gefangenhält. 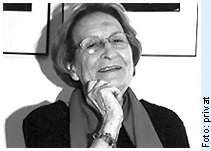 Montserrat Abelló, born 1918 in Tarragona, Spain, spent her childhood in different parts of Spain and England and studied Philosophy and Humanities at the University of Barcelona. During the Spanish Civil War (1936-1939) she worked as an English teacher and in January 1939, before the end of the war, she went into exile with her family, first fleeing to France and then to London and Chile, where she lived for almost twenty years. Abelló is writer who started relatively late in life, and published her first book of poems Vida Diària (Everyday life) in 1963 at the age of 45. Abelló’s poetry is notable for a voice that is at once firm and intimate, and for its overall consistency and unity of direction. Her life's work was published in 2002 in one volume entitled Al cor de les paraules: obra poètica 1963-2002 (In the Heart of Words: Poetic Works 1963-2002), for which in 2003 she received the Lletra d’Or Prize, as well as the Cavall Verd award, and Quima Jaume prize for poetry. Although Abelló began by writing poetry that was influenced by the social currents of the 50s and 60s, her personal perspective has always been brought to bear on her work, particularly her standpoint as a woman and as a mother - the birth of her mentally handicapped son was the impetus that made her to respond to her urge to write. Over the years, her poetic expression has become more free and increasingly refined. Themes like love, loneliness, the passing of time, the injustices the world is immersed in, and poetic creation itself, achieve in her poetry an incisive and personal expression, which recalls the best of the twentieth-century's English-language women writers. Abelló's poems have been translated into English, Spanish, Galician and German. As a translator herself, Abelló has been responsible for bringing a large number of English-language authors' works to a Catalan audience, including Agatha Christie, E.M. Forster, Sylvia Plath, Adrienne Rich, and many others. In 2007 she was awarded with the Cavall Verd-Rafael Jaume for her translations of Sylvia Plath, and in 2008 she received the Jaume Fuster Prize of Catalan writers and the Premi d'Honor de les Lletres Catalanes.